What it looks like to shop from the bulk bins at my food co-op! 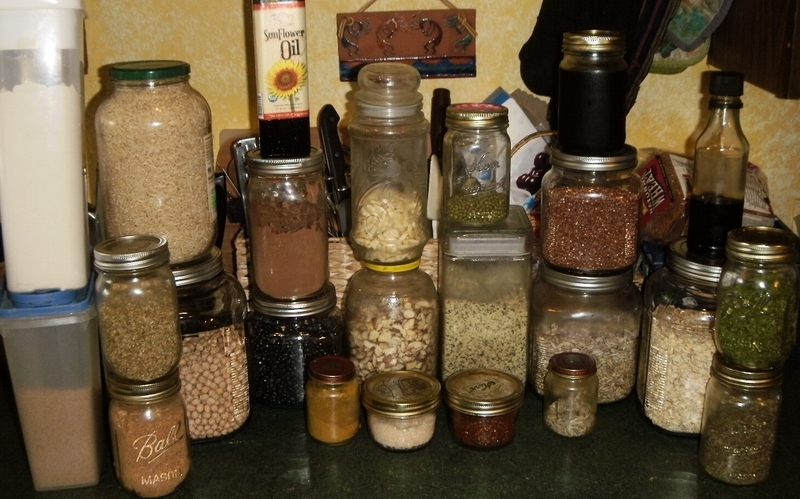 I was cleaning the fridge & starting pulling jars out & thought I’d snap a photo. The awesome thing about shopping this way is it’s both budget & eco-friendly, my favorite combo! Some of these jars I’ve been using for years, and it makes me very happy to know how much packaging I’ve saved. Mason jars are an easy find, and I pick up jars at rummage sales, and occasionally buy a new one here & there. The last 2 plastic containers I have are for sugar & flour, and I have large glass jars on my next shopping list to get rid of those- I believe my kitchen will be close to 100% plastic-free after getting rid of these. In the photo–100% organic: raw sugar, flour, brown rice, garbanzo beans, black beans, cocoa powder, almonds, hemp seeds, mung beans, sunflower seeds, quinoa, oats, maple syrup, tamari, basil, parsley, oregano, taco seasoning, curry powder, chili powder, lemongrass, sunflower oil. This is maybe 1/2 of the jars I refill at my co-op, which carries over 300 bulk items, and is a tiny co-op in a town of 500 people. Stuff comes in 25-50# bags, goes in a bulk bin. I bring my empty or partially empty jar (we do have bags & containers for those who don’t have their own), weight it, fill it & weight it again with the price/#. Some things seem like they’re expensive- parsley is something like $25/#, but to fill a Mason jar costs ~$2.00. I LOVE shopping this way, and can’t imagine life without my co-op!!!! UPDATE: those last few plastic containers you see in the above pic were finally swapped out for 2 gal glass storage jars. I now have 0 plastic storage! !